Are you a Professional Photographer (or do you get photographed professionally) and are in Need of Showcasing the images in the Best Possible Way? Well, either way we have got you covered. 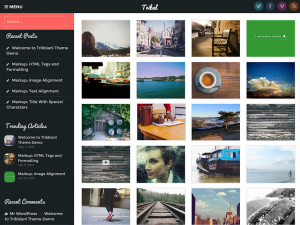 Tribal is a Premium Quality WordPress theme which has been designed keeping in mind, the needs of a Professional Photographer or Companies. It has a Beautiful Gallery Layout that works great for tube and cam sites, multiple layouts to display photos on homepage, a responsive slider, featured photos section and much more. Tribal is Full Responsive working on all Devices, Retina Ready and Translation Ready.